This is the latest release by this British progressive rock band and here they present us with a much more darker and heavier album than they have ever done in the past. They released their debut Songs From The Lions Cage in 1995 and this album, Contagion is their sixth studio album. The band consists of Mick Pointer, drums (ex-Marillion), John Mitchell, guitar, Rob Sowden, vocals (the third vocalist for the band), Ian Salmon, bass and Clive Nolan, keyboards, who along with Ian Salmon, also used to be in Shadowland. Clive's resume also includes collaborations with Oliver Wakeman, producing two outstanding concept albums, Jabberwocky and The Hound Of The Baskervilles as well as being the keyboard player in another progressive rock giant, Pendragon. Arena really hit their stride in 1998 releasing The Visitor, their best selling album to date. This band is huge in Europe and is widely considered to be one of the premier progressive rock bands in the world. Produced by Clive Nolan and John Mitchell, this album is based on a story written by Clive Nolan which examines one's search for salvation using expansive soundscapes to draw the listener into this epic that presents a dark and foreboding vision of the future. The music of this band is laden with influences from classic 70's progressive rock, but with a much harder and edgier sound, especially with the guitars. More up front guitar riffs give this band a more modern feel and also a much more darker quality to their music than some of their progressive rock forefathers. Arena takes a tired and almost obsolete genre of rock music and injects a new air of originality and energy resulting in a stunning, emotion packed album that is a pure pleasure to the ears of any progressive rock fan. Lots of influences from Marillion can be heard throughout this album in the dramatic style with which they deliver their musical messages. Emotional and heart-wrenching vocals with catchy phrasing over quiet piano passages are often mixed with heavier soaring pieces, carrying on in the true Marillion tradition that was put in place during the Fish-era of the band. Thematic and very expressive guitar and keyboard leads decorate many tracks on this album and Clive Nolan's use of choir-like mellotron effects gives some tracks the feel of the classic music of Strawbs and The Moody Blues from the 70's. Soaring synthesizer and rich melodic keyboard odysseys combined with the deep resonance of bass pedals really reminds one of the Trick Of The Tail and Wind And Wuthering era of Genesis. The expressive lead guitar of John Mitchell really brings to mind the playing of Andrew Latimer of another 70's progressive rock giant, Camel. The soaring solos and arpeggios, especially when combined with Clive Nolan's keyboard playing gives the band a very rich and uplifting sound. The vocals of Rob Sowden vary from a Fish style to even a bit of older Peter Gabriel as found on the classic Selling England By The Pound album. Song styles on this album range from a more darker style to entirely instrumental (3 in total) and even some more straight ahead structured songs with great emotional and memorable choruses. This is one of those bands that very quickly establishes a mood very early in their songs which is maintained throughout the entire track. Each one is a story, an entity unto itself that although is part of a whole concept, could easily stand on their own. They have a gripping and very charismatic style and succeed in creating an amazing album that flows flawlessly from one track to the next, creating an atmosphere with their songs that you can feel. The energy flow of this album is unwavering. 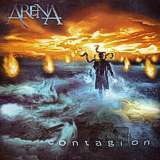 Comparisons could be made to other newer bands in the same genre such as Spock's Beard or Everon but Arena has produced a much darker sounding album. Technical flash is kept to an absolute minimum and full attention is placed on producing the best quality songs possible. Any fan of progressive rock, whether it's the newer forms or the classic 70's style should waste no time in picking this CD up. In a time when most people have given up on ever hearing a great new band capture all the sound and emotion of days gone by, Arena not only succeeds, but injects a new energy and excitement into an all but forgotten genre of rock music. So put away all your re-mastered Genesis CDs and rejoice in the light of a new day in the progressive rock world.